(A) WEST OF 1L-19R EXTENDED LOC CRS OF ACTIVE RWY AND NORTH OF 7R-25L EXTENDED CRS OF ACTIVE RWY. (B) EAST OF 1L-19R EXTENDED LOC CRS OF ACTIVE RWY AND SOUTH OF 7R-25L EXTENDED CRS OF ACTIVE RWY. A110-1 RY 07L/25R CLSD TO ALL JET ACFT. A110-10 ALL APCHS ARE OVER NOISE SENSITIVE AREAS; ALL TURBOJET ACFT SHOULD REFRAIN FM CONDUCTING MULTI VFR TFC PATTERN APCHS & DEPS WO PRIOR APVL FM AMGR CALL C414-747-5325. 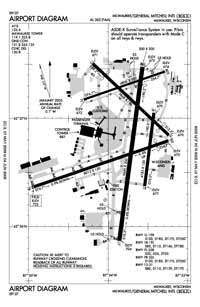 A110-2 TWY A CLSD FROM TWY R TO TWY E AND TWY E CLSD FROM TWY T TO TWY M AND TWY T NORTH OF RWY 07R-25L CLSD TO ACFT WITH TAIL HEIGHT GREATER THAN 54.5 FT DURING CAT II AND CAT III OPS. A110-23 ANG: PPR ALL ACFT, 48HR PN, CTC AFLD OPS DSN 580-8241, C414-944-8241. 128 ARW IS A FULLY OPERATIONAL KC-135R BASE WITH HRS OF OPERATION MON-FRI 1200Z-1930Z++ TUE-FRI, CLSD HOL, SAT-SUN EXC UNIT TMG, CALL FOR AVBL. 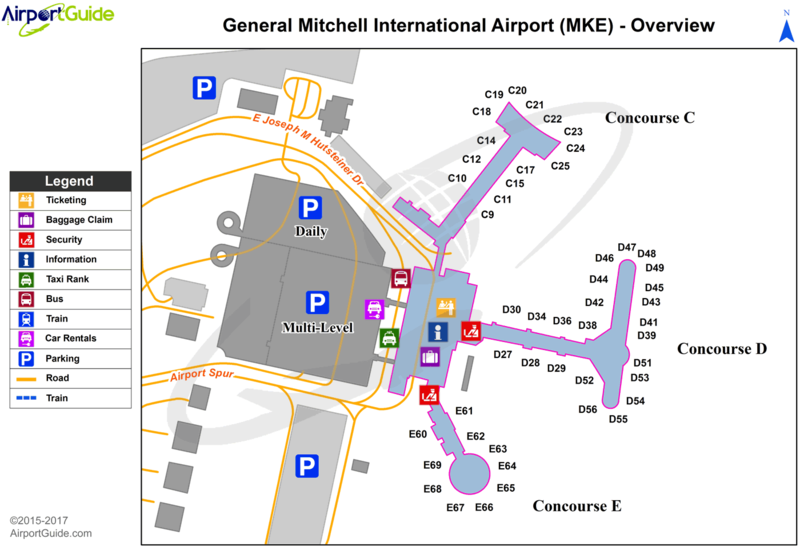 A110-24 ANG: ANY MDS'S (OTHER THAN KC-135) IS LIMITED TO STANDARD TRANSIENT MARSHALLING AND PARKING. NO TECHNICAL DATA AVAILABLE FOR TRANSIENT MAINTENANCE. FUEL AND AGE EQUIPMENT SUPPORT AVAILABLE FOR SELF-SERVICE. THERE ARE NO ADDITIONAL CONFIGURATION ITEMS SUPPORTED SUCH AS LANTIRN PODS, EDM PODS, ETC. A110-25 ANG: END OF RUNWAY FACILITIES, AIRCRAFT SHELTERS/REVETMENTS, AND ALERT FACILITIES ARE NOT AVAILABLE. AFLD/ACFT PARKING CONCERNS INCLUDE: LIMITED STATIC GROUNDING POINTS AND NO AIRCRAFT TIE DOWN POINTS. A110-26 ANG: NO FLEET SVC/HOT CARGO PARKING AVAILABLE. CTC UPSET CTRL 20 MIN PRIOR TO ARR TO RCV CURRENT BIRD WATCH COND AND PARKING INFO. A110-27 ASDE-X IN USE. OPERATE TRANSPONDERS WITH ALTITUDE REPORTING MODE AND ADS-B (IF EQUIPPED) ENABLED ON ALL AIRPORT SURFACES. A110-3 RY 13/31 CLSD JET ACFT, UNLESS PMSN FROM TWR OR AMGR 414-747-5325. A110-5 TRNG FLGTS INVOLVING SUCCESSIVE USE OF ANY RY PROHIBITED 2200-0600. A110-52 ACFT WITH WINGSPAN GREATER THAN 175 FT CANNOT PASS SIMULTANEOUSLY ON TWY 'E' & TWY 'Z'. A110-54 TWYS D1, F2, H, J, F1, P AND F (EAST OF RWY 19R) AND TWY K (EAST OF RWY 19L) CLSD TO ACFT WTIH WINGSPAN GREATER THAN 78 FT.
A110-55 TWY F (WEST OF TWY Z) CLSD TO ACFT WITH WINGSPAN GREATER THAN OR EQUAL TO 118 FT UNLESS PERMISSION FROM ARPT DIR AT 414-747-5325. A110-56 RY 19R TODA 8,750 FT FROM INT TWY V.
A110-57 TWY V BTN TWY D AND RY 7L/25R CLSD TO ACFT WITH WINGSPAN GREATER THAN 170 FT WHEN RY 7L/25R IN USE. A110-58 TWY B BTN TWY V AND TWY P CLSD TO AFCT WITH WINGSPAN GREATER THAN 170 FT.
A110-6 RYS 13/31 & 01R/19L & 07L/25R CLSD EXCP LGT WT SINGLE ENG ACFT 0400-1200Z DLY. A110-60 HOLDING BAY AT RY 19R WHEN IN USE, TWY Z ADJACENT TO BAY IS LIMITED TO ACFT WITH WINGSPAN UP TO 170 FT.
A110-61 RY 07L/25R NO ACFT 65,000 LBS OR GREATER ALLOWED TO TAXI BTN TWY D & RY 13/31 AND EAST OF RY 19R. A110-62 RY 01R-19L AVAILABLE TO AIR CARRIERS FOR TAXI ONLY. A110-64 TWY S & TWY T BTN TWY R & RY 07R/25L AND RY 07R/25L BTN RY 1R/19L & TWY R CLSD DURG CAT II & III OPNS. A110-68 HOLDING BAY AT RY 01L CLSD EXCP ACFT WITH WINGSPAN LESS THAN 118 FT.
A110-70 ANG: NSTD MRK ON PRK APRON FOR WINGTIP CLNC; SEE AFLD MGT FOR DETAILED MAP. A110-71 RUNWAY 7L/25R NOT AVAILABLE FOR SCHEDULED AIR CARRIER OPERATIONS INVOLVING AIRCRAFT DESIGNED FOR 10 OR MORE PASSENGER SEATS & UNSCHEDULED AIR CARRIER OPERATIONS INVOLVING AIRCRAFT DESIGNED FOR 31 OR MORE SEATS. A110-73 ALL AIRCRAFT PUSHBACKS FROM GATES C20, C21, C22, C23, D39 D41 D43, D45, D48, D51, D53, D54, D55, E65, E66, & E67 REQUIRE CLEARANCE FROM GROUND CONTROL. PUSHBACKS FROM ALL OTHER GATES ARE AT RAMP/ PILOT DISCRETION; CONTACT GROUND CONTROL WHEN READY TO TAXI. A110-74 TWY C CLSD BTWN APCH END OF RWY 7L AND TWY D1 TO ACFT WITH WINGSPAN GTR THAN OR EQUAL TO 118 FT UNLESS PMSN FM ARPT MGR 414-747-5325. A110-8 BIRDS ON & INVOF ARPT. A110-9 PREFERRED USAGE BY ACFT BTN 2200-0600 IS TKOF RY 19R & LNDG RY 01L. A26 ARFF INDEX D EQUIP AVBL UPON REQUEST. A57-13 APCH RATIO 27:1 TO DSPLCD THLD; 87 FT TREE 2375 FT TO DSPLCD THLD; 490 FT LEFT. A57-19R APCH RATIO 36:1 TO DSPLCD THLD; 100 FT TREE 3641 FT TO DSPLCD THLD; 901 FT RIGHT. A57-25L RWY 25L APCH RATIO 29:1 TO DSPLCD THLD; 39 FT POLE, 1140 FT TO DSPLCD THLD; 544 FT LEFT. A57-31 APCH RATIO 27:1 TO DSPLCD THLD; 42 FT RR 1160 FT TO DSPLCD THLD; 290 FT R.
A58-19R FENCE 148 FT FM THLD; 391 FT R OF CNTRLN. Dual Wheel Landing Gear: 185. Dual Wheel Landing Gear: 115. Dual Wheel Landing Gear: 110.